Whether he is acting out a scene, telling a story, performing solo or with others, Patrick has always turned in a stellar performance here at Caltech. His words connect with the audience, and the moods he creates with the harp are breath-taking. He is a master interpreter of the legendary Irish harper, Turlough O’Carolan in particular. 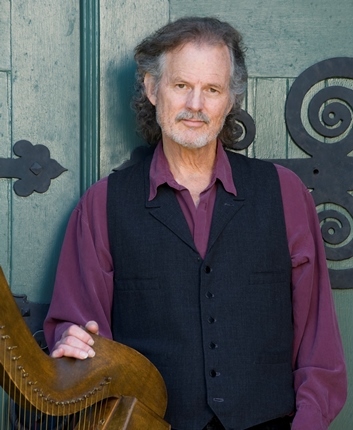 Don’t miss this chance to be swept away by this master storyteller as he transports you to other lands and he treats you to an evening of achingly beautiful harp music. Tickets can be purchased on the phone (626-395-4652) with a credit card (a service charge will be added per order), purchased at the Caltech Public Events Ticket Office at the Winnett Student Center for face value (Generally open Monday-Friday 9AM-4PM), purchased online (click on red ticket below- service charge added per ticket, sales end 2 days before show), or purchased at the door for cash or check (no credit cards.) Occasionally, a show will be sold out before the day of the show, so call the Ticket Office, if you are planning to buy tickets at the door. Better yet, join our mailing list and you’ll be informed about such situations ahead of time.